Oh hey ladies! We are back with our SECOND challenge week at OHT, and boy are we excited for what is in store. Last time, we challenged you to be in the Word every day for seven straight days in a row. If you check out our show notes from the first challenge episode, you will find a reading plan for Psalm 119 along with a suggested study method. Shoutout to everyone who joined us in this and for sharing with us how it went through social media! In honor of the new series we are about to kick off on Philippians, the challenge for this week will be…drumroll please….we will be reading through the book of Philippians on REPEAT!! Specifically, we want you to read through the entire book twice EVERY day of this week. Repetition is key when studying scripture, and the purpose of the challenge weeks is to help you put into practice different methods for studying scripture. When you are reading through a book of the Bible, one of the best ways to become more familiar with the content and to grow your understanding of it is through re-reading it. The beauty of re-reading Philippians is that you will learn the way Paul talks, you will learn the phrases that he uses, you will learn the people that he references, the places that he talks about, and when we begin the process of breaking down the text in this series, you will be so familiar with it! As a resource for you, we have recorded the book of Philippians all the way through. You can listen to this while driving to work, walking to class, or strolling through the grocery store. Whether you read it, or listen to it, the goal is to read it TWICE everyday. Like always, we’d love for you to let us know how the challenge is going and what you are learning. Share these things with us through social media and don’t forget to invite a friend to join. 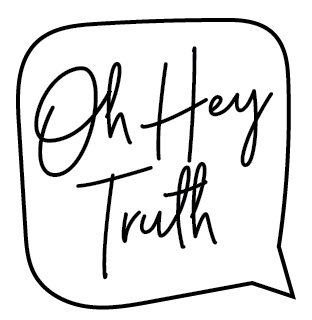 You can find us on instagram at @ohheytruth or on Facebook! We will also be sharing other fun resources with you through these outlets as well.